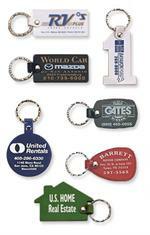 These custom vinyl key fobs are a great way to promote your car dealership or repair garage. We print your business information in your choice of design. These affordably priced key fobs offer excellent value with a soft feel and\good durability.